Back in July 2012, Lionsgate confirmed that Suzanne Collins' final Hunger Games novel will be split into a two-part movie. The decision, which came just months after The Hunger Games franchise launched, angered many fans of the books, and it seems that strategy may have backfired. Box Office Mojo reports that The Hunger Games: Mockingjay Part 2 took the top spot at the box office with $101 million, the lowest opening weekend of all four movies. The $101 million opening weekend is far lower than many box office projections, many of which predicted the franchise finale would earn around $120 million. The Hunger Games opened in 2012 with $152.5 million, followed by 2013's The Hunger Games: Catching Fire, which opened with a franchise-high $158 million, and last year's The Hunger Games: Mockingjay Part 1 with $121.8 million. 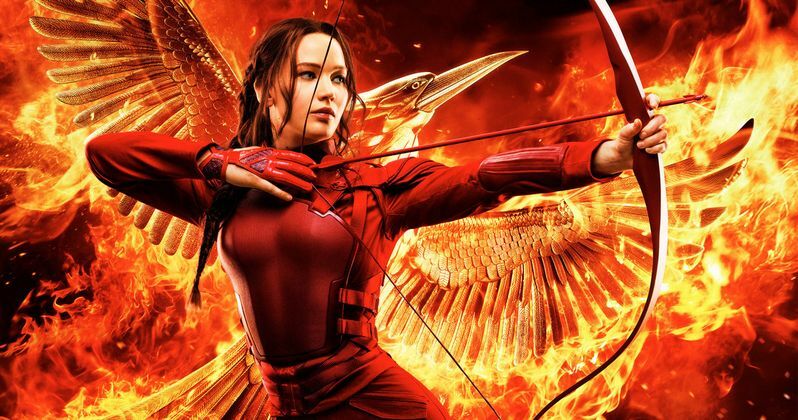 The franchise has taken in $2.2 billion worldwide since opening just three years ago, and while The Hunger Games: Mockingjay Part 2 may be the end of Katniss' (Jennifer Lawrence) story, there have been rumors of spinoffs and other sequels that are being developed by Lionsgate. With the nation of Panem in a full scale war, Katniss (Jennifer Lawrence) confronts President Snow (Donald Sutherland) in the final showdown. Teamed with a group of her closest friends - including Gale (Liam Hemsworth), Finnick (Sam Claflin), and Peeta (Josh Hutcherson) - Katniss goes off on a mission with the unit from District 13 as they risk their lives to stage an assassination attempt on President Snow who has become increasingly obsessed with destroying her. The mortal traps, enemies, and moral choices that await Katniss will challenge her more than any arena she faced in The Hunger Games. As expected, Spectre dropped to second place during its third weekend with $14.6 million. Spectre currently has a $153.7 million domestic gross, and it should have no trouble reaching $200 million or possibly even $300 million domestically, but this action-packed adventure is really raking it in overseas. The blockbuster has taken in $413.8 million in international markets for a current worldwide tally of $542.8 million after just two weeks in theaters. It's certainly possible that it could become only the second 007 movie to crack the $1 billion worldwide landmark, following 2012's Skyfall. The Peanuts Movie dropped to third place with $12.8 million. The Night Before opened in fourth place with $10.1 million. The new comedy stars Seth Rogen, Joseph Gordon-Levitt and Anthony Mackie as three friends who gather together every year on Christmas Eve, a tradition that is about to come to an end. They set out to find what is known as the Holy Grail of Christmas parties to bring their tradition to a close with a bang. The supporting cast includes Lizzy Caplan, Jillian Bell, Ilana Glazer, Randall Park and Michael Shannon. Secret in Their Eyes rounded out the top 5 with $6.6 million. The Hunger Games: Mockingjay Part 2 opened in 54,17 theaters this weekend, followed by The Night Before in 2,960 theaters and Secret in Their Eyes with 2,392 theaters. The Hunger Games: Mockingjay Part 2 is already scoring big with critics, earning a healthy 81% "Fresh" rating from Rotten Tomatoes, with The Night Before earning a respectable 71% "Fresh" rating. There aren't enough reviews available for Secret in Their Eyes, which features an all-star cast of Julia Roberts, Nicole Kidman, Chiwetel Ejiofor, Michael Kelly and Dean Norris. The thriller follows an FBI investigator (Julia Roberts) whose daughter has been kidnapped. Rounding out the top 10 is Love the Coopers ($3.9 million), The Martian ($3.7 million), Spotlight ($3.6 million), The 33 ($2.2 million) and Bridge of Spies ($1.9 million). The little-known Bollywood musical Prem Ratan Dhan Payo made a surprise splash by cracking the top 10 last weekend, taking eighth place with $2.4 million. The film only opened in 287 theaters, bringing in an impressive $8,452 per-screen average, but the film dropped out of the top 10 to 14th place, earning $640,000, dropping 73.6% from its opening weekend. The film stars Salman Khan as a prince who is recovering from an assassination attempt, four days after his coronation, who is replaced by a benevolent lookalike. Also opening in limited release is Carol, starring Cate Blanchett and Rooney Mara, which earned $248,149 from four theaters, for an impressive $62,037 per-screen average. Legend starring Tom Hardy, which expands nationwide on December 11, took in $83,000 from four theaters for a $20,750 per-screen average. Mediterranea took in just $2,500 from two theaters for a paltry $1,250 per-screen average. No box office data was released for #Horror starring Chloë Sevigny and Timothy Hutton . Carol is considered an early awards season favorite, after debuting at the Cannes Film Festival this May and hitting the film festival circuit throughout the summer. Both Carol and Legend are opening in four theaters this weekend, but unlike Legend, it isn't known if there are plans to expand Carol nationwide. Looking ahead to next weekend, three new movies will open in wide release, Warner Bros.' Creed starring Sylvester Stallone and Michael B. Jordan, 20th Century Fox's Victor Frankenstein starring Daniel Radcliffe and James McAvoy, and Pixar's The Good Dinosaur. All three films will open this Wednesday, November 25, just before the Thanksgiving holiday, with three more films opening in limited release on Friday, November 27. The Danish Girl, another awards season contender starring Eddie Redmayne, Alicia Vikander and Amber Heard, opens alongside a pair of documentaries, Janis: Little Girl Blue and Killing them Safely. Take a look at the box office projections for the weekend of November 20, and check back Sunday for the estimates.